Manali, a popular tourist destination in Himachal Pradesh, has become the first town of the state to levy an entry fee on vehicles belonging to other states. The move is likely to generate an annual revenue of around Rs 1 crore. Driven to bankruptcy, the Himachal Pradesh Government has finally signed a memorandum of understanding with the Centre concerning fiscal reforms to get its withheld revenue deficit grant released. Eight students of the Dr Y.S Parmar University of Horticulture and Forestry at Nauni were rusticated today and eight others put on a conduct probation for a period of two semesters after they were indicted by the high-powered inquiry committee probing March 25-26 violence on the campus. The Principals and Headmasters of 313 senior secondary and high schools of the district today demanded that the vacation schedule of the schools be changed and there should be no board examination for the eighth and Plus I classes. Chaudhary Sarwan Kumar Himachal Pradesh Agriculture University (Palampur) Vice-Chancellor Dr Tej Partap today asked scientists to develop pastures and grasslands to help farmers in hills. Thousands of people thronged the local St Edward School to participate in a live game show, “Open the door, win more”, hosted by popular television anchor Aman Verma, here last evening. It was a grand finale to the Kangra Valley Summer Festival in the police grounds here last evening. Contrary to the expectations of the organisers, thousands of people turned up to watch Punjabi singer Hans Raj Hans perform live. Former “Akashwani” Director and prominent musician, composer and writer Dr Keshva Anand died in his home at Raura Sector here today. Dr Anand (68) had been ailing for the past some time. Mr Kaul Singh , Irrigation and Public Health Minister, has asked officers concerned to prepare a contingency plan to deal with the water shortage. Presiding over the meeting to review the drinking water situation in the state, he directed the officers to visit the drought-hit areas and take effective steps to cope with the problem. The General Officer Commanding-in-Chief, Western Command, Lieut-Gen J.J. Singh, today urged students of Army Public School to imbibe the Army’s ethos of secularism, discipline and professionalism to meet the challenges. Students of Army Public School present a dance item on the occasion of 18th founders’ day of the institute at Dagshai on Tuesday. Army units serving peace tenures on rotation basis in the Western Sector will not be permitted to spend more than two months annually in field exercises and operational tasks. National Vice-President of the Akhil Bharatiya Hindu Shakti Sena, Mahant Swami Virendranand Giri, yesterday, reiterated his demand that the temple towns Kangra, Chamunda, Jwalamukhi, Naina Devi and Chintpurni in the state be declared holy towns and meat and liquor shops shifted out of these towns. Installation of a hot-mix bitumen plant, work on which is in progress, by the HP Public Works Department, Nurpur division, on the Pathankot-Mandi national highway has been agitating residents as it poses air pollution threat in the area. The Chairman of the HP Ex-servicemen Welfare Corporation, Col Mohinder Singh, here today said that the corporation had decided not to engage any more trucks for carrying cement from Barmana (Bilaspur) to other areas. A court here yesterday, convicted Ashwani Kumar, of Simas village, Ladbhrol Tehsil for possessing 2.25 kg charas and sentenced him 10 years imprsioned and fined him Rs 1 lakh. The Judicial Magistrate, Mr Rajesh Tomar, convicted Naratoo Ram and sentenced him to one year imprisonment besides fining him Rs 1,000 for assaulting an HRTC conductor on duty at Rajo village. The Department of Tourism and Civil Aviation has issued a notification dated May 29 wherein buses will be charged an entry fee of Rs 500, jeeps like Tata Sumo, Safari, Scorpio and Qualis Rs 300, cars and vans Rs 200 and two-wheelers Rs 100. Sources in the department said the notification had been issued as per the directions of the High Court with a view to regulating traffic and avoiding congestion, which becomes the order of the day during peak tourist season in summer. A public interest litigation had been filed in the High Court in this regard. The notification mentions that the fee on vehicles will be a one-time levy valid for a week and during this period no other charges like parking fee will be charged by government or any other agency. “The notification has been issued as per the directions of the High Court dated April 19, this year, the revenue generated would be spent on creating infrastructure facilities like better roads and civic amenities,” said Mr Vijai Singh Mankotia, Tourism and Civil Aviation Minister. Maximum number of tourists, especially foreigners, visit Manali during summer. “Since these days people are willing to spend on holidays, I feel this would not affect tourist inflow to Manali,” opined Mr Mankotia. He added that at present there was no move to extend the fee to any other tourist destination in the state. It is also learnt that the local administration in Manali had been directed to work out a way to save those locals having vehicles with outside registration numbers from paying the fee. It is estimated that around Rs 90 lakh to Rs 1 crore will be generated as revenue through this fee. While the Manali Hoteliers Association has welcomed the decision, it has demanded that the revenue generated be spent on strengthening infrastructure facilities like roads, parking lots and toilets. “We welcome the move, provided the money generated is not diverted for other purposes,” said Mr Gautam Thakur, president of the association. He added that the fee should not be levied permanently but for about three years only till the facilities were developed. He added that since people were willing to spend for quality services, the imposition of fee was not likely to affect tourist inflow to Manali. During the peak tourist season i.e. from May to June, around 1,000 vehicles from outside the state enter Manali daily. Mr Virbhadra Singh, Chief Minister, today confirmed that the memorandum had been signed but said details would be made available during the ensuing Budget session commencing from June 7. The 11th Finance Commission had linked grants to fiscal reforms and 15 per cent of the recommended grants were to be released only to those states which carried out reforms. The state had been facing a severe resource crunch as its revenue deficit grants amounting to over Rs 450 crore had been withheld by the Centre because of its failure to pursue fiscal reforms in the right earnest. The Centre had made it clear that mere commitments on the downsizing of the administration, disinvestment and curtailing government expenditure will not do. A memorandum will have to be signed to pursue the reforms in the right earnest. The Budget to be presented next week will provide ample indications about the measures the government proposes to take to fulfil the terms and conditions of the memorandum. While the Chief Minister maintained that no section of society should be worried about fallout of the memorandum, it is quite obvious that drastic measures are in offing to downsize the administration and to cut down unproductive expenditure. Sources said the terms laid down in the memorandum were very stringent, particularly in the matter of fresh recruitment. The government will be able to fill only functional posts in the health, education and some other department. There will be a complete ban on recruitment and even daily wage staff will not be engaged. A legislation providing for criminal action against officers making recruitments in violation of the ban will be enacted. Even the appointments given on compassionate grounds will be limited. As far as possible the vacant posts will be filled by redeployment of the existing staff. A fiscal responsibility legislation will be enacted to cap the government borrowings and the amount of guarantees it could provide for raising loans by the public sector undertakings. The government will also be barred from making any fresh grant -in-aid commitments to any institution and freeze or scale down the existing level grants after a review. It will also not provide any financial support to public sector undertakings, which will have no option but to raise their own resources. The outstanding debt of the state is already in excess of Rs 15,000 crore and it is raising loans to the tune of about Rs 2400 crore annually to make both ends meet. The annual interest liability is Rs 1875 crore. The liability on account of pensions will also have to be brought down and to achieve this objective it will adopt the new scheme, which the Centre proposes to introduce. While five students — Kushal Negi, Sanjay Negi, Pankaj Sharma, Vikas Thakur and Syed Mubashir have been rusticated for two semesters, other three Neetan Khajuria, Dinesh Negi and Hitender Patial have been of rusticated for one semester. The Vice-Chancellor, Dr S.S. Negi, while informing about the notification of the report, said the committee had given the erring students found guilty of gross indiscipline and for bringing disrepute to the university the barest minimum punishment as laid down in the academic regulation of the university. Another eight students — Sanjeev Sharma, Khub Ram Singh, Vivek Garg, Rajinder Chaunhan, Sunny Sidhu, Mazid and Sanam Chopra — had been placed under conduct probation for two semesters for their involvement in the act of indiscipline. Taking a serious view of the damage to property in the Vice-Chancellor’s residence as well as the gymnasium, the committee which assessed the loss at Rs 15,042, had imposed a fine of Rs 80 and Rs 25 on each boy and girl student, respectively. The students who continued their peaceful agitation, while refusing to accept the report, termed it as biased and questioned why no official of the university had been indicted. They asked as to why only university students had been left to face the brunt and the visiting boxers had been given a clean chit though a number of university students too had faced injuries. The Vice-Chancellor when quizzed in this connection, however, said none of the official had been found guilty, including the Student Welfare Officer. The visiting students could not be punished as these was little that the university could do in that matter. Meanwhile, undeterred by the fear of loosing their academic semester the students continued their protest with even girl students joining in the 11-dayold stir. The Dean, College of Horticulture, however, maintained that the committee was probing the role of students only and hence no official was indicted. The magisterial inquiry report would establish the guilt of the officials, if so proved, he said. The police deployment remained to avert any untoward incident. The rusticated students were directed to immediately vacate their hostel rooms with the receipt of notices which were personally handed over to them. Students boycotted the classes for the 11th day today even as the Vice-Chancellor urged them to resume studies with barely four days remaining for the semester examinations to begin. The Vice-Chancellor maintained that since the university had earned a bad name by violent disruption of a national boxing championship where boxers from 42 universities were participating, it was imperative to punish the evening students. Though it would not bring back the lost glory but it would send a right signal to the 300 universities which were eagerly awaiting the decision, he observed. The dismissed SCA president, Munish Thakur, was released today after he obtained a bail from a local court. The SCA was holding discussions till late in the evening to chalk out their future course of action. The demand was raised by the Principals of senior secondary schools and Headmasters of high schools during their first half yearly meeting in the GAV Senior Secondary School here today, which was chaired by the Deputy Director of Education, Dr R.D. Sharma. The Principals said the board examinations started in March every year and the admission process to the next classes started after June 15 when the board declared the Matric and Plus I classes results. They complained that from April 1 to June 20 every year the lecturers had no teaching work in the schools and the students remain idle. The Principals expressed concern over the present defective educational system where the students did not get the required number of teaching days during an academic year. They said soon after board results the admission process started and got completed in the schools by June end or early July, which was followed by summer vacations from July 17 to August 20. They said it was practically in the last week of August every year that the class work started. They demanded that the vacation schedule be changed. Dr Sharma said the Principals had also demanded that there should be no board examination for the eight and Plus I classes on the pattern of the CBSE. He suggested that the board should use its energy in declaring the results of the Matric and Plus II classes expeditiously. The Principals demanded that the school timings in summers should be changed from 8 a.m. to 2.00 p.m. to 9.00 a.m. to 3.00 p.m.
As many as 125 headmasters of high schools and 188 Principals of senior secondary schools from Kangra, Palampur, Nurpur and Dhera subdivisions demanded the intervention of the Chief Minister, Mr Virbhadra Singh, and the Education Minister, Ms Asha Kumari, to reshape the educational system. Chaudhary Sarwan Kumar Himachal Pradesh Agriculture University (Palampur) Vice-Chancellor Dr Tej Partap today asked scientists to develop pastures and grasslands to help farmers in hills. Inaugurating the three-day workshop of the All-India Co-ordinated Research Project on Forage Crops, Dr Tej Partap said that fodder crops like sorghum were good for areas under irrigation but in Himachal marginal lands were main source of grass and fodder. He said the state’s rural economy depended on animal wealth. The Vice-Chancellor said that in hills absence of nutritious fodder was turning milch cattle barren forcing farmers to abandon these. He said only sustainable pastures and grasslands would ensure prosperity of hill people. Dr Tej Partap cautioned that technological developments without ensuring environmental protection could lead to disasters. Dr S.P. Tiwari, Additional Director-General, Indian Council of Agriculture Research, said development of forage crops was essential for progress of farmers and assured all help for this. He favoured development of marginal and waste lands for fodder growing. Dr R.C. Thakur, Director, Research, CSK HP Agriculture University, appealed for more funds for research in grasslands and pastures. It was accepted by Dr Tiwari. More than 100 farm scientists are participating in the workshop. Thunderstorm and heavy downpour here failed to dampen the spirit of enthusiasts as the school ground was fully occupied. The inclement weather delayed the start and the show continued right up to midnight. It was a five-round affair and for each round 15 participants were selected. At the end of each of the first four rounds, two winners were given prizes. In the final jackpot round, Neha Sharma of the local Auckland School won diamond jewellery worth Rs 25,000, while Sunnay, an alumnus of St Edward School, won gifts vouchers worth Rs 10,000 and Pashav of ADS School got a Samson television. The show was organised in the aid of the Literacy India, a non-government organisation working for the underprivileged children. Dr L.S. Pal has been appointed the Principal of Indira Gandhi Medical College. Dr Pal, from the Faculty of Medicine, replaces Dr H.L. Kapoor, who retired yesterday. At present Dr Pal is the Principal of Dr Rajendra Prasad Medical College at Tanda in Kangra district. It was a grand finale to the Kangra Valley Summer Festival in the police grounds here last evening. Contrary to the expectations of the organisers, thousands of people turned up to watch Punjabi singer Hans Raj Hans perform live. The surging crowd gave the police a tough time. The Sufi singer mesmerised the audience with a host of songs, including “Ae jo sili sili aandi ae hawa”, “Kurti mal mal di”, “Behki behki chal hai” and “Dil tote tote ho gaya.” He also sung some Himachali folk song with the help of local artistes. Earlier, Himachali folk singer Karnal Rana and artistes of the Hijacker group enthralled the audience. Artistes of the Shyamla Kala Manch and the North Zone Cultural Centre, Patiala, also performed. Rural Development and Panchayati Raj Minister, Mr Sat Mahajan was the chief guest. Winners of the baby show, which was part of the three-day festival, were given away prizes. He had written a number of books on Himachal folklore and was himself a good singer. Folk songs sung by him were very popular among Bilaspur residents. These used to be aired on the AIR, Shimla. He started his career as a science teacher, but shifted to AIR, Shimla. He had retired as the Director of the AIR, Jodhpur, a few years ago. He was awarded Directorate in Music by Bhatkhande Music University, Gwalior. He was cremated on the bank of the Sutlej today. A number of local leaders and people from all walks of life attended his funeral. Mr Kaul Singh , Irrigation and Public Health Minister, has asked officers concerned to prepare a contingency plan to deal with the water shortage. Presiding over the meeting to review the drinking water situation in the state, he directed the officers to visit the drought-hit areas and take effective steps to cope with the problem. He said water tankers would be pressed into service and feasibility for installing handpumps would also be explored. The non-functional pumps would be repaired and leakages plugged on a priority. He also said the connections given from the main supply line should be removed and booster pumps installed by the consumers should be disconnected to ensure equitable distribution. It was informed during the meeting that out of the 7,142 water supply schemes 1,795 had been affected because of reduced discharge in the water sources. All traditional sources of water were being disinfected by involving the panchayats. He also reviewed the action plan for the year 2004-05 under the water supply and flood control sectors. Addressing the students, their parents and staff of the school on the occasion of the institute’s 18th founders’ day, the General said: “We as a nation are still in the process of fighting a number of divisive forces, both within and outside the country, which threaten subversions amongst us”. Stating that the country faces challenges from corruption, religious fanaticism and unequal distribution of resources, General J J Singh said these could be solved if the students followed the basic thinking and philosophy of the Army. He said the Army took pride in being a totally secular organisation and being completely apolitical in its work and approach, for which it is respected the world over. Discipline, he added, is the very basis for not only producing work on time, but also for producing quality output. The Army Commander also announced that an air rifle and an air pistol would be presented to the school by Western Command to groom potential shooters. He also gave away prizes to students for outstanding performance in different fields. Earlier, in his report, the Principal, Col N.S. Rawat (retd), highlighted the activities and achievements of the school. He said the school had started a reunion of old students and NCC for boys and girls. 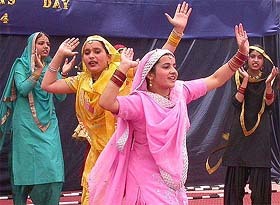 Students staged a cultural programme, which included plays, solo and group songs as well as folk dances. A painting, art and craft and a science exhibition were also organised. The GOC, 2 Corps, Lieut-Gen G.D. Singh, who is the patron of the school, Lieut-Gen R.S. Dayal (retd), and Maj-Gen R C Jerath, the school’s founding fathers, were among a host of senior officers present on the occasion. The parents of Maj Udai Singh of 1 Para, who was killed in counter-insurgency operations in Rajouri in November 2003, will sponsor the education of a six-year-old girl, whose father, belonging to the same unit, was killed in action. Major Udai Singh, an alumnus of the school who had passed out in 1992, had been decorated with the Sena Medal and the Shaurya Chakra. While Udai’s mother, Sudha, broke down on the occasion, his father, Col K.K.K. Singh, said they would be bearing all educational expenses of the girl at the school. The education of two more children from the same unit, whose fathers had lost their lives in operations, would also be sponsored, he added. He also presented a framed picture of Udai to the Principal, to be displayed in the school. Stating this while interacting with mediapersons at Army Public School here today, the GOC-in-C, Western Command, Lieut-Gen J. J. Singh, said he had issued orders to this effect recently. “This is to ensure that units coming to peace stations after a hard tenure in Jammu and Kashmir or the North-East are able to rest, recuperate and carry out normal training cycles,” he said. “All field-firing and other exercises will have to be done within two months,” he added. This, he said, would result in the troopers being charged-up and ready for any eventuality. On the recent issue of alleged fake killings by some officers in Siachen, he said the acts of one or two officers indulging in such acts should not cast aspersions on the image of the Army as a whole. The disciplinary process initiated into the matter would take its own course, he added. On being asked about the implications of the change of guard at the Centre, he said the developments did not affect the services. Swami Giri in a letter to the Himachal Governor V.S. Kokje, sought his intervention for getting these towns declared “holy”. He told mediapersons here that the BJP had not improved management of government controlled temples in the state. It was the responsibility of the Chief Minister, Mr Virbhadra Singh, to get these towns declared holy to maintain the sanctity of these towns. Installation of a hot-mix bitumen plant, work on which is in progress, by the HP Public Works Department, Nurpur division, on the Pathankot-Mandi national highway has been agitating residents as it poses air pollution threat in the area. The PWD authorities reportedly didn’t take clearance from the Pollution Control Board and overlooked the ill-effects the plant would cause. The plant is being set-up in an area where a school, a silk factory and a number of shops and houses are located. Ironically, the Himachal Pradesh government is celebrating World Pollution Day on June 5 but its department is busy on a project that will spoil the environment. The authorities of the Pollution Control Board admitted that the HPPWD had not taken clearance for the project. The board has also served a notice on the PWD authorities in this connection. Meanwhile, the HPPWD sources revealed that the plant was portable and posed no threat to environment. They asserted that the plant was necessary for patchwork job on the highway. The Chairman of the HP Ex-servicemen Welfare Corporation, Col Mohinder Singh, here today said that the corporation had decided not to engage any more trucks for carrying cement from Barmana (Bilaspur) to other areas. The decision was taken in view of large number of trucks being engaged by the corporation. In a statement, he clarified that at present there were nearly 1,200 trucks registered with corporation and doing carriage work. He said in addition to this, 258 more trucks had been registered by March 20. He, however, clarified that in future only those persons who had applied for loan with the corporation till May 20, 2004 would be entitled to be put on cement carrying work at Barmana. Ashwani Kumar was driving a van (HP-01-0065) on Nov 6, 2002, the police signalled him to stop at Pandoh, but he did not do so and fled towards Mandi. The Mandi police intercepted the vehicle at the Bindrabani Forest check post near Mandi, on search the narcotic was recovered from the van. The police registered case under Section 20 of the Narcotic Drugs and Psychotropic Substances Act and arrested him. The prosecution examined 14 witnesses. The court holding Ashwani Kumar guilty of the offence held that both independent witnesses have admitted to their signatures on the recovery memo and packet of charas. The Judicial Magistrate, Mr Rajesh Tomar, convicted Naratoo Ram and sentenced him to one year imprisonment besides fining him Rs 1,000 for assaulting an HRTC conductor on duty at Rajo village. The prosecution said Naratoo Ram had some altercation with the conductor over bus fare and he assaulted him on September 2, 1998 at the village. A man was sentenced to six-month imprisonment and fined Rs 500 for bootlegging. Mr R.K. Kaushal, Additional District Attorney said 42 bottles of country-made liquor were seized from Rajesh .Kumar, a resident of Mallan, on September 6, 1995 at Mallan village.